And this is my little contribution…. featuring Nice People Nice Things fabric (By Red Rooster), EPP Hexies and a touch of my beloved embroidery. Of course I had to use my passion of the moment – hexies… using none other than my so simple to use iron ons…. If you have been following my blog in the past you would have heard lots about these and know that I am totally addicted. If you are new here on the blog tour then read on…. you too will be totally hooked on this latest and most definitely the new and only way to do hexies and other English Paper piecing… I thought I’d include a little tute for all of the new visitors today..
Iron on Wash out hexies…. These hexies are precut from Hugs ‘n Kisses Appliqué paper which is a 50% soluble natural paper with glue on one side. Fold the edge over with your thumb and forefinger until you feel the edge of the paper and then press down onto the glue. tada! - ready to assemble hexie… with not a single tacking stitch in sight. Now you just stitch them together as normal – use a whip stitch, appliqué needle and fine thread, OR you can actually stitch together by machine if you are in a big hurry..
NOW – the kicker is…. normally you would now need to take the tacking out or pull up the glued seam allowances and remove the paper! ughh…. not the fun bit…. but with this paper – you just leave it in there – its lovely and stable, holding everything nicely in its place… Just glue down onto your background fabric (I use Roxanne’s glue baste it) – then appliqué into place. When you have finished wash your project and the 50% soluble stiff bits will dissolve and the rest (natural soft fibres) will just stay safely in your quilt. well there you have it! are you simply amazed? Just have to try this right now? well if you want to you can get the hexies here right now OR in just a few more days (they are on their way) from here in the US. The appliqué paper can be used to use this method in any English Paper Piecing design and of course turned appliqué as well. there are some more tutes on the right here under pages about this. one new facebook liker – like my page here and write a message on my wall saying hi! Have you seen this magazine? Its GenQ, They are relatively young and started as an online magazine, quickly progressing to print version after a great debut into the younger market. The magazine is a different sized format to what we are used to here, quite cute actually… it contains the usual advertising but also interviews, shop reviews, products reviews, projects, articles and general news…. quite a bit of reading actually. This issue has an interesting test drive on several embroidery floss brands.. They were tested by a range of stitchers from young and new to older and experienced. Pleased to see that my preferred brand Presencia fared well. On their website at www.generationqmagazine.com they post a few times a week, with projects, review, features, columns and other fun stuff – and that’s all free. This mag finishes with a list of 25 cool embroidery sites they have chosen… alas not mine….. feeling too old to be cool….but some good and interesting ones there.. I used Colourworks solids from Lloyd Curzon Textiles (Northcott) and they were great to work with – I very rarely work with just solids and it was fun to do so…. Simple quilting using the pieced squares to give a cathedral window design added to the quilted cushion cover.. The bit you have been waiting for….. I have four copies of the mag to giveaway…. okay, now I need to go ‘cool up’ my website…and maybe make next years list! hugs for today, be back soon with Europe pics to share…. This magazine arrived on my doorstep some time ago (actually I think the next issue may be out) but I have just found it in a pile and thought I’d let you all know.. If you have loved Twas the Night before Christmas and the coordinating patterns – the table runner, tree skirt and Santa sack, then you may be interested in another to match.. There it is… a little table centre – little in size but not in the amount of stitching – sorry, lots of therapy in there for you.. I think you need to subscribe to this magazine to get it here but it is well worth it – always a treasure to flick through the pages. It is the Simply Vintage mag from Quiltmania. Melissa’s BOM ‘Thankful’ which teaches you heaps of dimensional techniques And a Tassie feature (okay I'm biased) but I hadn't actually heard of a couple of these stores..
Oh – and I also know that the Life is Beautiful fabric shipment arrived Friday and the Distributor spent the weekend unpacking to send to stores this week! yay…..
Whilst at market it was lovely to meet the 100 blocks team from Quiltmaker and receive my BIG badge and coffee mug… Now I’m big on Boobie buttons but this was just a tad big to wear proudly on my chest so it was positioned in my booth so that visitors could search out all the participants at the show. Not sure that all 100 were there but there were certainly a lot.. I was amazed at how many people are collecting this series of magazines and keeping them as reference tools for 100’s of block designs. and even more excited to see that my first block had made the cut. 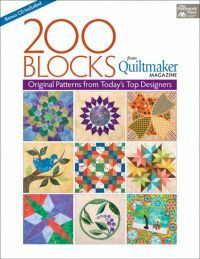 I loved that block design – I really should use it in a quilt one day..
As I head up the highway for the last Rowing Regatta weekend of the season I just wanted to quickly show you that the Spring Special of the wonderful Quilt Mania Magazine has arrived. This is the issue that has the matching Pyjama bag to the Bunny quilt which was in the recent Homespun magazine many of you have already coveted. This uses the leftover strips of scallops from the quilt which I made using the new Scallop rulers – fun! They have been running out the door here so I gather many of you are having fun with them also. hideho up the road I go, have a great weekend everybody..
AP&Q – the American one that is..
Whilst away I had several messages about a project I could not remember…. so I was keen to get home and see what was in my pile of mail…. This little quilt was left with the Editor over two years ago and finally made its appearance in this months issue of American Patchwork and Quilting. If you have been a blog friend for some time you may just remember tiny peeks several years ago as I had promised to use up the cutoff triangles from the Great Summer Mystery Quilt – do you recognise them? The red spots? I'm right down the back, page 100 actually, but I am still very excited… For those that have asked it is an old fabric range now by Tanya Whelan for Free Spirit Fabrics… But this would look great in any range of soft pretties – and you can always get a red spot and a pink stripe somewhere! I used my Glue stick appliqué method but of course you can use any method. Hopefully this may be the first of more to come now that we have the logistics (legal stuff) worked out for international contributors. For those of you who get to see it, hope you like it! Have you seen this months Easter edition of Homespun? Not sure if its on the stands yet but I am very excited to have a little teeny weeny part of the front cover.. It seems so long since I was playing hide and seek with these little bunnies and my appliqué needle… but all the fun memories are returning now.. I always look forward to how Catherine and her team display and photograph the projects – and I think I'd love to snuggle up under this quilt in this bed! This quilt uses a fantastic ruler I found at Quilt Market last year – the Scallop ruler! it was so easy to make long long lengths of these scallops to cut and use on all sorts of things. it was from the leftovers – and if you watch out for the next edition of Quiltmania you’ll see a few more leftovers along with a matching project for this quilt. I have only the 1.5” version used in this quilt at this stage which comes with this great and handy pusher tool to make perfect smooth scallops.. If you’d like kits in a similar fabric contact The Quilted Crow or Sarah at Quilt Fabric Delights and I am sure they will be able to help you out. Oh, and whilst you are perusing the Homespun Mag check out the most absolutely adorable and gorgeous Hunny Buns by Annie of Country Keepsakes…..